I've been fighting a losing battle on both my Intel and PowerPC laptops trying to keep the cooling fans spooled down. Nostalgically, I recall the days of mostly silent computing, running my old Mac Plus booted from a floppy disk and, later on, my blessedly fanless PowerBook 5300 from a RAM disk with the hard drive spun down. That was blissful - at least the lack of fan and hard disk noise. Performance is another matter. Speed generally means more heat generated, although there are notable exceptions, such as with solid state drives. 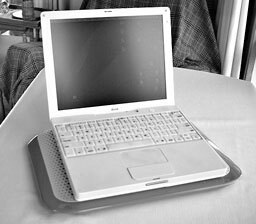 Actually, my current Unibody Core 2 Duo MacBook was the quietest laptop I'd had since the RAM disk happy 5300 - but only as long as I ran Mac OS X 10.5 Leopard on it. 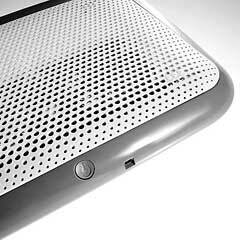 Booted from Leopard, it typically ran well below the cooling fan tip-in threshold, and its 160 GB 4200 RPM hard disk drive buried in the sound-deadening slab of its unibody aluminum chassis was barely audible. However, since upgrading to OS X 10.6 Snow Leopard, it's been a constant struggle to keep the MacBook's cooling fan quiet. A least it's not as raucous as fans in older Mac laptops (maybe the unibody effect again), but with my typical suite of production applications open, it idles at about 78° to 79° C, just a degree or two below the fan-toggling point, so it only takes a minimal intensification of processor activity to trigger a fan spool-up. I had hoped in vain that this issue might improve with Snow Leopard incremental updates, but the converse obtains, if anything. It seems to run a bit hotter in versions 10.6.6 and 10.6.7. 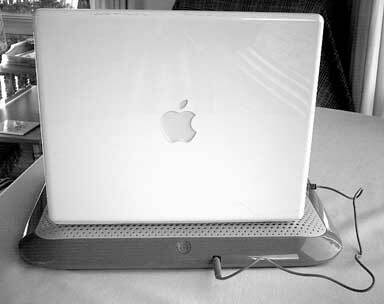 I've resorted to keeping a Targus AWE41US Chill Mat for Mac (under $20 from Amazon.com) fan-assisted cooling stand/lapdesk running under the MacBook full-time to try to cool things down. Still fans, you say? 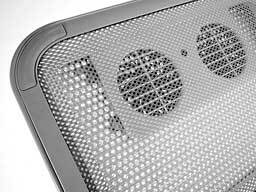 Yes, but the Chill Mat's two USB-powered, large-diameter, slow-turning cooling fans are much quieter than the MacBook's internal fan, making about the same amount of noise as some hard drives and at a lower, less irritating frequency. The latest iteration of the Targus Chill Mat for Mac is faced top and bottom with soft, breathable nylon mesh that is comfortably gentle on your laptop's bottom-side and to your lap - or whatever other support surface upon which it rests - protecting from scratching and chafing as well as insulating from and reducing heat. Measuring 15.16" x 11.22" x 1.45" and weighing 1.6 lb., the Chill Mat for Mac can comfortably accommodate all Apple laptop models up to the 17" MacBook Pro and including older 17" PowerBook G4s. Its two single-speed fans, controlled by a pushbutton on/off switch, push cooling air upward toward the bottom of the laptop, targeted, according to Targus, at Mac notebook hotspots revealed by engineering studies. 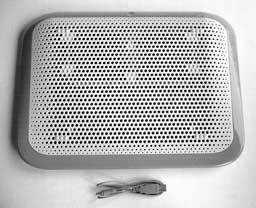 Power is supplied by one of the computer's USB ports via a supplied 28" USB cable that plugs into a port on the back of the Chill Mat. The fans don't draw a whole lot of power and are claimed to diminish a battery charge life cycle by roughly 15 minutes, and that's no issue at all when plugged in to wall current. The Targus Chill Mat for Mac lists for $34.99 and is covered by a 1-Year Warranty. Moving along, it's no longer blissful silence with my workhorse Pismo either. Back in the day, the Pismo's cooling fan might have cut in once in a while on the very hottest summer days, but most of the year, at least here in Nova Scotia, you wouldn't have known that the computer had a fan. No longer. 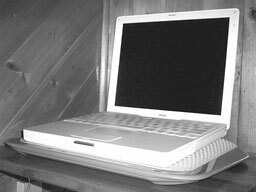 Now that the Pismo is hot-rodded with a FastMac 550 MHz G4 processor upgrade, 768 MB of RAM, and a 5400 RPM Toshiba hard drive, the fan is heard from nearly daily, and it's much noisier when it does run than the fan in the MacBook. Part of the problem is browsers. I usually have three open. I love TenFourFox for its speed and feature set, and it has extended the useful Internet life of our old PowerPC machines for a bit longer, but it does seem to be a bit of a resource hog. OmniWeb 5.10.3 is evidently less covetous of RAM than TenFourFox, but it is also slower, and Opera is fast but no longer a happy camper on PowerPC, so it seems I'm stuck with the intermittent fan cacophony. Actually, I still find old Netscape Navigator 9 to be the most satisfactory browser for OS X 10.4 Tiger on PowerPC. It's decently speedy, stable, and not especially resource-hungry, has lively Finder response, but with development having been terminated more than three years ago, I'm leery about potential security deficiencies. The browser issue in general is what's probably going to sink PowerPC Macs as production platforms eventually. Even the TenFourFox folks concede that the future is limited and the curtain is dropping on the PowerPC era. Hard to say exactly when the accretion of quotidian hassles, incompatibilities, and annoyances like the fan cycling will reach the point that I'll abandon my beloved Pismos, but I perceive that it's likely not far off now.